Cotoneaster franchetti is a relatively common native species in the UK. They are often found in dry soils where they are fast growing shrubs that produce tall arching branches (to 12ft/3.5 metres) and numerous suckers around the base. 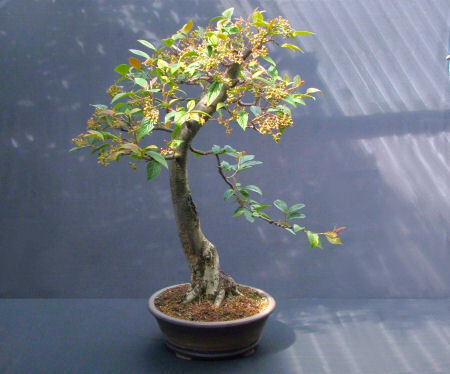 They are not an ideal species for bonsai , principally due to their large leaf-size and long internodes, this means that a large trunk is generally required for maximum effect as a bonsai. The tree that is the subject of this progression series was found growing in thin dry soil on old derelict ground where it had produced one tall main trunk surrounded by dozens of suckers and self-sown seedlings that had germinated around its base. 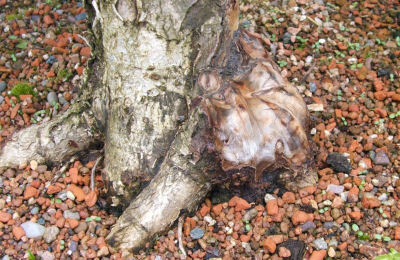 February 2005: Due to the sheer size of the trunk and its interesting movement I decided that the trunk of this tree would be worth collecting and in February 2005 I dug it up. As with most dry-soil loving species, this cotoneaster had a very shallow and compact rootball and despite its size (approximately 3 metres before being trunk-chopped) collection was relatively easy. The image above shows the tree on the day of collection, here it can be seen after soaking in water for an hour and it had been bare-rooted to remove all ground soil. The large terracotta bulb-pan was approximately 20"/50cm in diameter but relatively shallow, an ideal container for the roots of this tree. An hour later the Cotoneaster had been potted up and pruned back hard leaving only the growth that I felt was necessary for the final design of the tree. At this point I was intending to produce a multi-trunk bonsai and so 3 principle trunks were left along with two smaller shoots that had possibilities as minor trunks. July 2006: By the following summer the majority of the primary branches had been chosen. 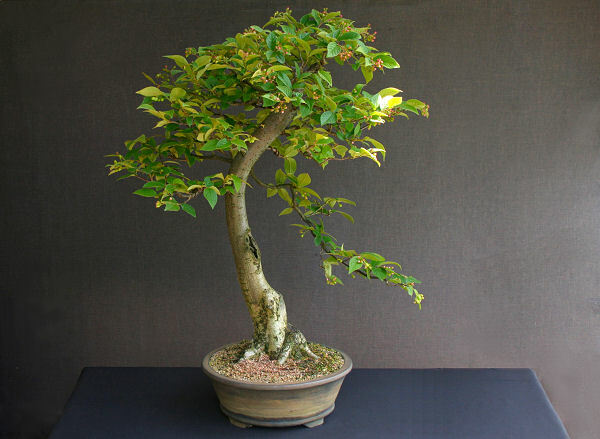 I had also decided that the tree would need to be a single-trunk bonsai; unfortunately the large leaf size of this species would mean that the smaller trunks I had hoped to use would never really look good while the tree was in leaf. The tree was (and still is) very apically dominant so that it needed continual pruning to direct vigour to the first branch (on the right). As can be seen in the image above, the main movement of the trunk is towards the right, therefore I needed the first (or 'character') branch to also grow towards the right to compliment the overall image. During the previous Winter I was faced with deciding which of the new shoots to develop into the first branch; as can be seen, I decided to use a branch growing from behind the trunk nearly 2/3 of the way of the trunk. 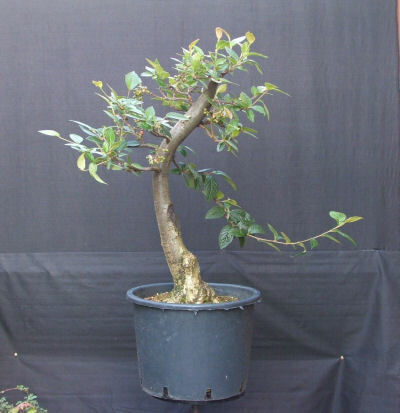 The often quoted bonsai 'rules' or guidelines will state that the first branch should start a 1/3 of the way up the trunk and will also be the lowest branch. 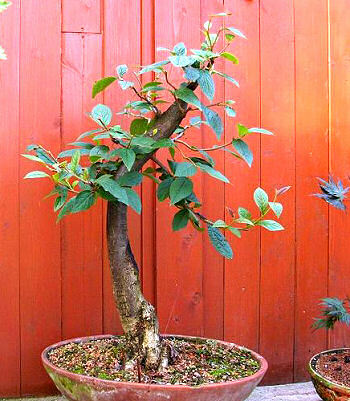 I feel this tree is a good example of where enthusiasts should remember that the bonsai rules are ONLY guidelines. Given the available options of using this 'rule breaking' shoot as the new first branch or possibly waiting several years for a bud to break in the 'correct' position of the trunk purely because some enthusiasts may see it as a 'fault' (for a variety of reasons grafting isn't really an option here), I chose the sensible route and used what was available to me. 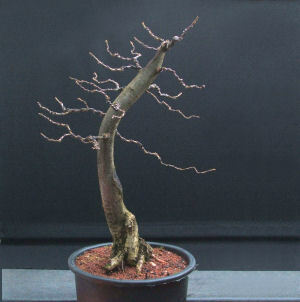 Looking at the final images of the tree as a bonsai, does it really matter that the first branch breaks a few rules? This image shows a close up of the trunkbase; this large wound was the result of removing a sucker/minor trunk. 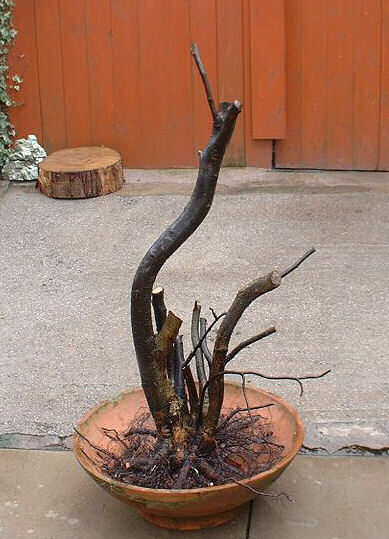 While the presence of deadwood at the base was not an issue in my eyes and could be carved to look pleasing, I did have a worry that the wood would eventually rot away, reducing the visual impact of the trunkbase. So the wood was carved to give a pleasant outline and treated with several applications of wood hardener. The deadwood was then masked with a combination of acrylic paints and bark with a resulting effect that can be seen in the images below. December 2006; the tree has been pruned back; each and every branch has been wired to provide plenty of interest and movement. 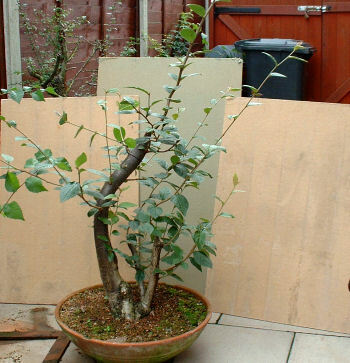 As can also be noted, the tree was transferred to a nursery container as the terracotta pot split during a particularly hard frost. August 2007; the tree had continued to develop well through 2007, as can be seen the first branch was allowed to grow unchecked again in an effort to thicken it up. 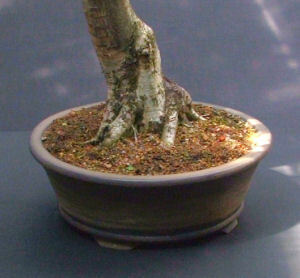 March 2008; the bonsai was potted up into a 13" diameter round bonsai pot from ErinBonsai.com, the trunkbase including the roots is approximately 6.5"/16cm in diameter. 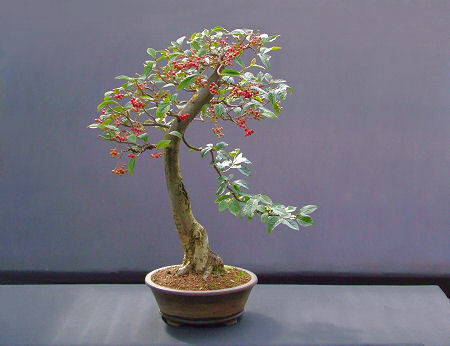 June 2008: Previously I had removed all flower buds as they slowed the development of the tree into a bonsai but in 2008 I allowed it to flower for the first time. 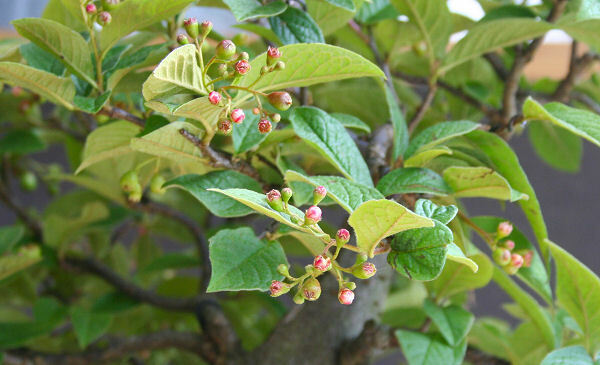 However, all flower buds were still removed from the first branch to encourage maximum vegetative growth in it. The flowers of Cotoneaster franchetti are small and insignificant and last only a few days before quickly turning to green berries. 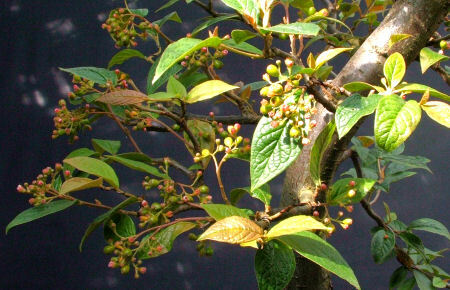 As can be seen in the image above, it is common for there to be a mixture of flowers and newly-formed berries on the tree at the same time as flowering is spread over a number of weeks. 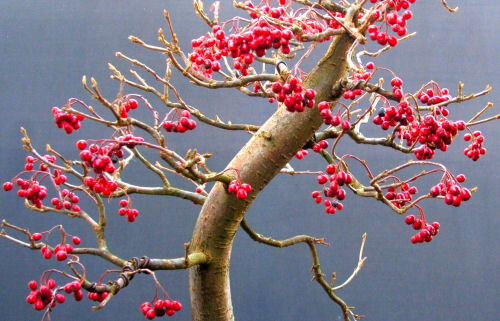 August 2008: By August the berries have ripened and are a spectacular bright red. 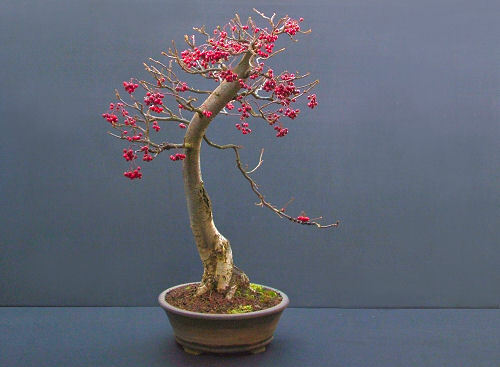 They will persist on the bonsai well into the Winter; unless the birds get to them first! January 2009: Following winter pruning and wiring. 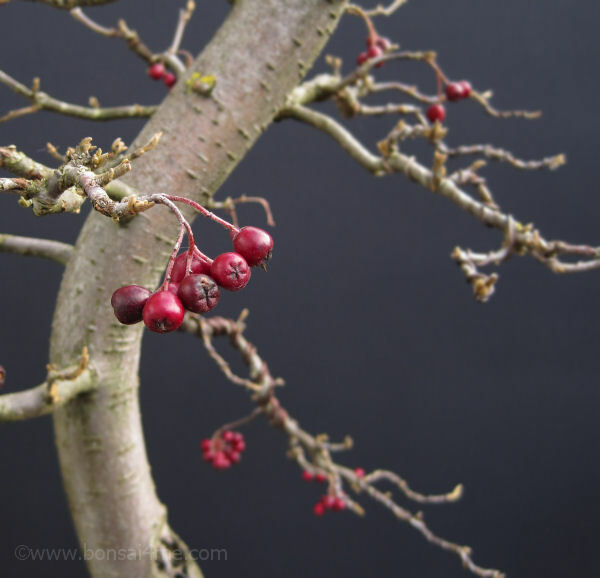 The berries have survived on the bonsai through the winter and are one of the few splashes of colour in the garden at this time of year. 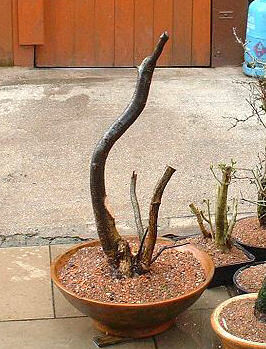 Update November 2010: In the Autumn of 2009 I decided to hard prune the branches of the bonsai with two purposes. Firstly to remove some upper branches that had become out of proportion (too thick) for their position on the tree. And secondly, to improve the taper of all branches throughout the tree. 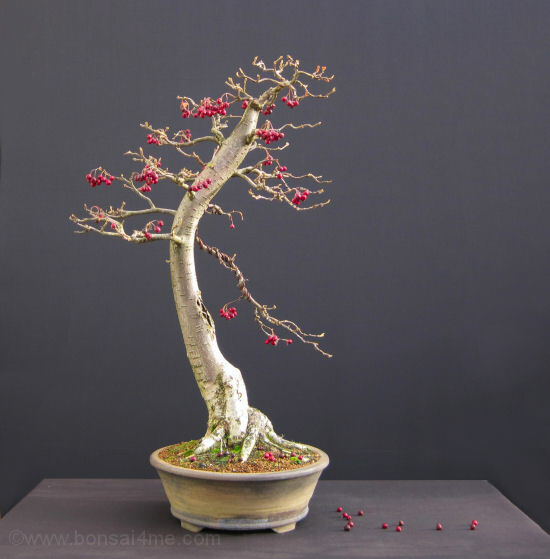 Copyright � 2010 Bonsai4me. All rights reserved. Reproduction in whole or in part in any form or medium without permission prohibited.